My favourite type of mid week dinners are anything free of fuss and ideally made in as few pans as possible to save washing up. 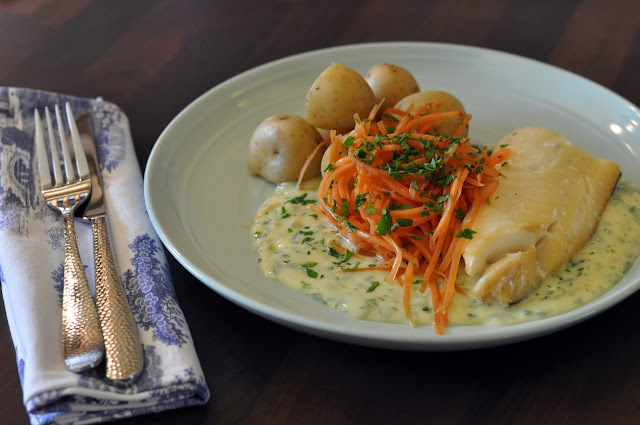 This recipe for poached smoked haddock and steamed veggies can be made in less than 30 minutes, including a homemade sauce! 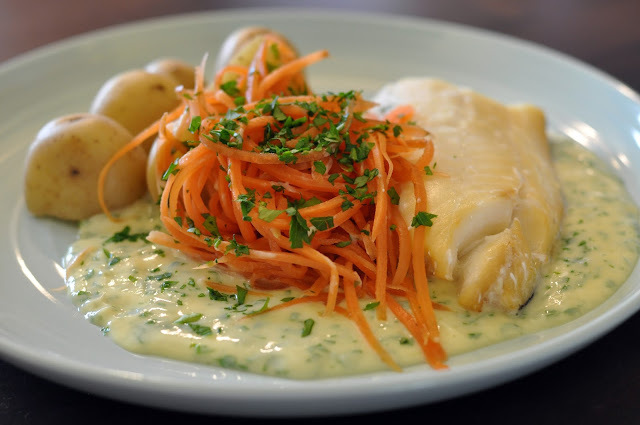 Smoked haddock is my absolute favourite fish, any way it comes. In this recipe, poaching the fish in milk is a great way to make it tender and flaky. The sauce gives a fresh and salty balance, and the veggies can be steamed in one pan. A quick fuss-free supper, serve with new potatoes and steamed carrots. 1. Bring a pan of water to the boil and add new potatoes and a pinch of salt. Simmer for around 10 minutes, until tender. 2. In a large pan, add the haddock fillets and milk (add parsley stalks if you have some). Bring to the boil, cover and leave to gently simmer for 3-5 minutes. 3. Take off the heat and leave the fish in the pan to continue to steam for 5 minutes. After which, the fish will flake when a fork is pressed into it. 4. Place the fish on warm plates and set aside. Set a collander on top of the potatoes and add the carrots to steam for 2-3 minutes, whilst making the sauce. 5. Mix the cornflour with 2 tbsp water. In a small pan, bring the milk from the fish to the boil and add the cornflour mix. Stir continuously until the sauce thickens. Stir in the capers, most of the parsley and season. 6. Spoon the sauce over the fish, or around the plate. Serve with carrots, potatoes and a sprinkle of leftover pasley. This recipe was made for Leisure Cookers Fish Tribe, check out their impressive fishy shoot and other recipes here.